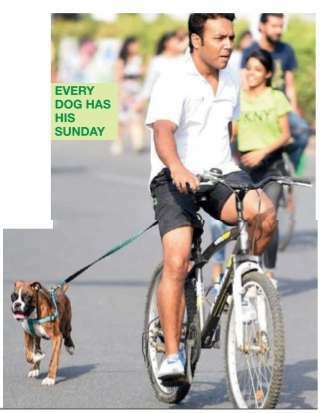 Delhiites shook off their Sunday laziness and joined in the fun at this Sunday's Raahgiri Day in Connaught Place, an event supported by The Times of India. Raahgirs gathered early in the morning to walk, dance, cycle and make a healthy start to their day. The session began with old school games reminding everyone of their childhood days. 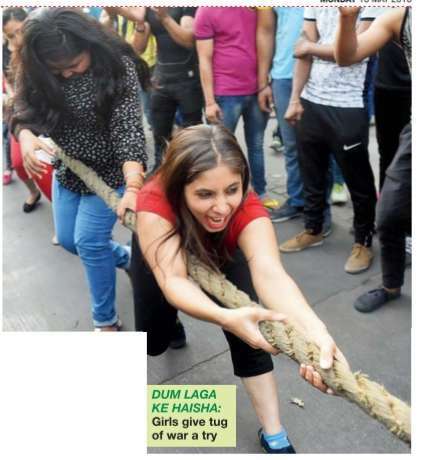 GIRLS TEST MUSCLE POWER: Games like tug of war and armwrestling were some of the activities that tested the muscle power of the young Dilliwallahs. Girls too didn't lag behind. As boys tested their physical strength with arm-wrestling, girls showed off their strength at the tug of war, as they tried their best to win. “I have played such games only in schools. It's after ages that I am having the same kind of fun and feeling like a school girl again,“ admitted Meenakshi Doshi. DANCE, MUSIC, MASTI: While some were entertained by the body balancing acts by Versatile Dance Academy , who displayed various formations, others laughed out loud at a laughter therapy session by Delhi Laughter Club. A apy session by Delhi Laug Bollywood workout session by A Square Acad emy dedicated to Bollywood lovers aptly concluded the day's activities.